This was a quick and easy Random Act of Kindness… adding a few quarters to a donation jar. 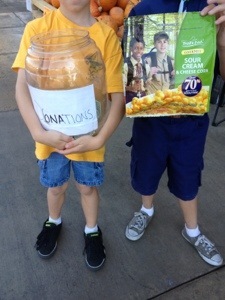 In this case, it was a Boy Scout fundraiser set up right outside a grocery store. No, I didn’t want any popcorn. Yes, I was in a rush. But it was for the Boy Scouts. How could I say no?